Congratulations to Derek Hennen for receiving a Theodore Roosevelt Memorial Research Grant for his collections based research on millipedes. Thanks to the American Museum of Natural History (AMNH) for providing this funding. The wonderful thesis work of Victoria Wong on the natural history of the social millipede Brachycybe lecontii is now available. Congratulations to Victoria, the first graduate student from the lab! Be sure to check out her amazing scanning electron micrographs and illustrations. 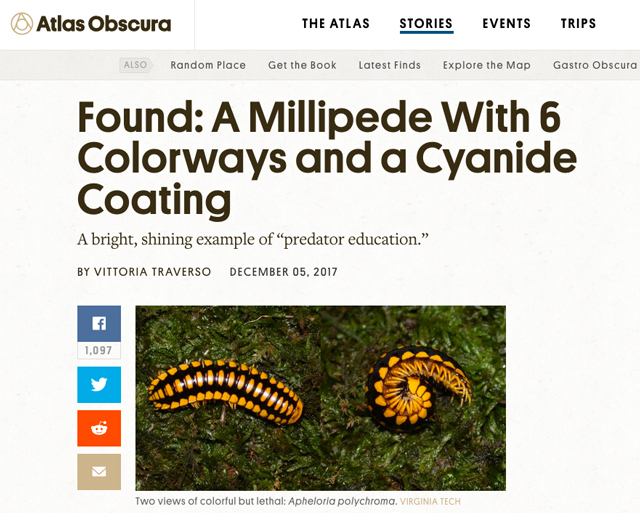 Vittoria Traverso from Atlas Obscura talked with us about the discovery of a new millipede, Apheloria polychroma, and wrote an article about research in our laboratory. 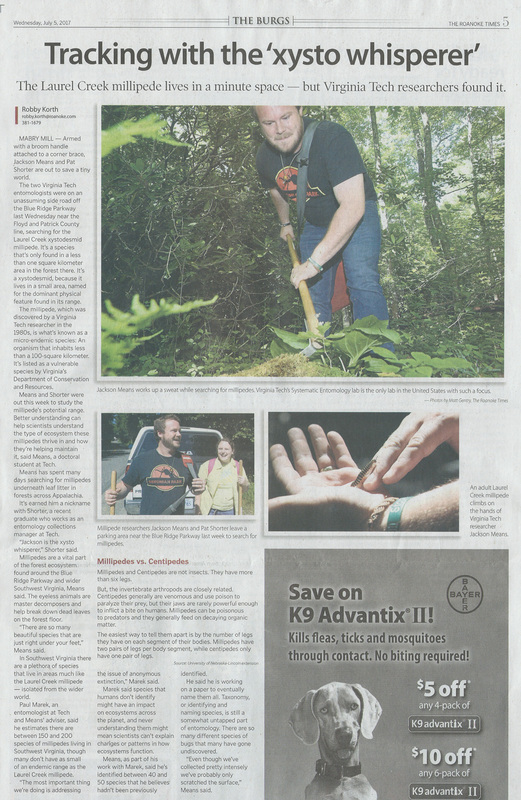 The Roanoke Times highlighted the research of lab member Jackson Means, who is studying the Laurel Creek Millipede, Sigmoria whiteheadi. In the article, Jackson discusses the rarity of the species and the ecological importance of millipedes. The International Institute for Species Exploration at SUNY-ESF included Illacme tobini, a millipede that we described in the lab, in their 2017 Top Ten New Species. Other new species in the list are the Sorting Hat spider, Devil orchid, and Swimming centipede. 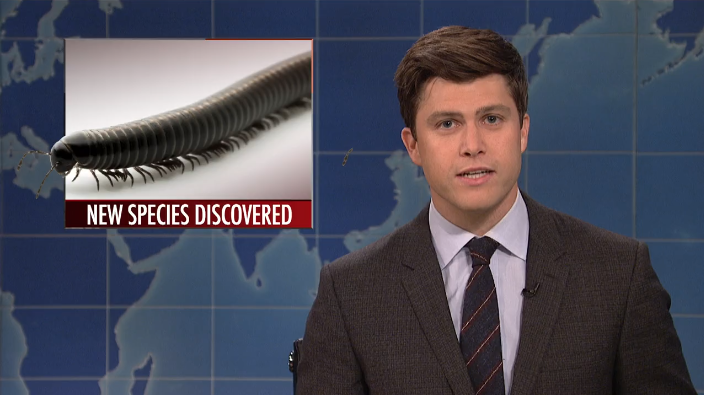 Our lab’s new millipede species and its anatomical challenges with walking discussed on Saturday Night Live’s Weekend Update. 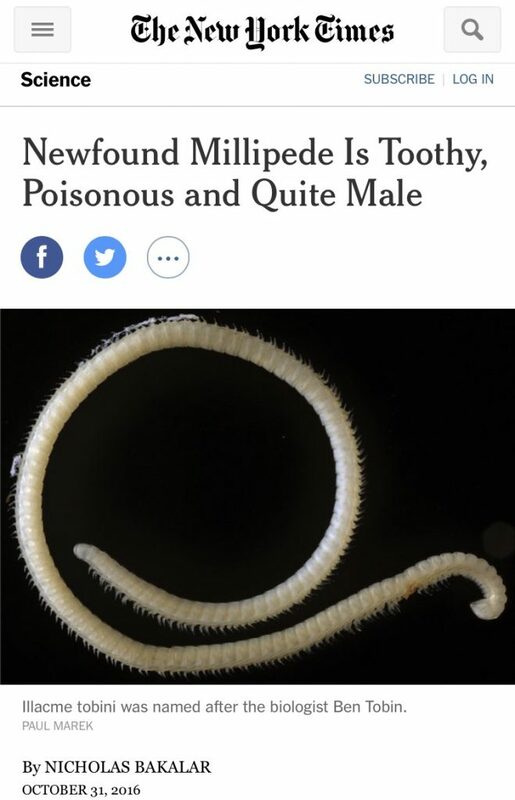 Our recent paper describing a new species of millipede was highlighted in the New York Times, Washington Post, La Vanguardia, Le Point, Sputnik Deutschland, and Phap Luat Plus! Field work started early this year with a survey of myriapods in Jefferson National Forest in the winter (February – April) and spring (May). Buotus carolinus (family Buotidae), Cleidogona hoffmani (Cleidogonidae) and Dixioria fowleri were the targeted species. We found several new populations of the rare and enigmatic (and minuscule < 4 mm long!) species B. carolinus. Individuals of this species were encountered beneath rocks and in accumulations of dead leaves and scree. 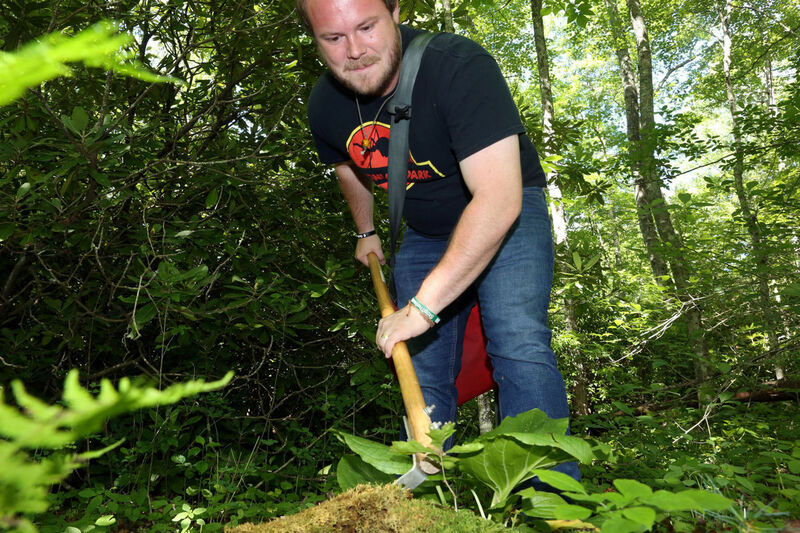 This summer, PhD students Jackson and Derek are collecting throughout Appalachia. Earlier this month, they traveled to eastern Virginia, Tennessee, and Alabama and now they’re headed to Georgia and North Carolina. This year’s winner of the First Annual Photuris Challenge is Derek Hennen! Congratulations Derek phor being the phirst of the pholks to phind phive Photuris! 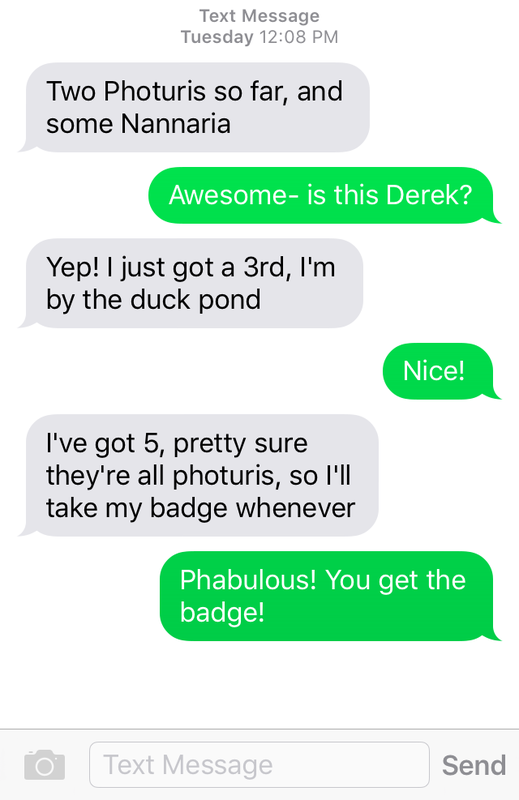 As a prize for this significant discovery and saving our Bugfest booth from being just about fluorescent scorpions, Derek receives the first ever Photuris Discovery Badge. Derek won’t be able to bask in the cold glow of his discovery though as he is traveling to Arkansas today to defend his masters thesis. Thanks Derek for the wonderful discovery and saving the day! Welcome to the newest members of our lab: Rhea Wong and Derek Hennen! Rhea joins us from the University of Illinois Urbana-Champaign where she recently graduated as an Entomology major. Rhea began entomological research as a high school student in the laboratories of Alison Hansen, Barry Pittendrigh and May Berenbaum. In the masters program here at Virginia Tech, Rhea plans to study the physical properties of insect iridescence (as part of her research position in the Virginia Tech Insect Collection) and the natural history of the fungivorous social millipede Brachycybe lecontii Wood, 1864. Derek, from the Entomology Department at the University of Arkansas, has quickly become an expert in millipede and insect natural history. Derek studied the endemic arthropods of Arkansas and was funded by the Ohio Biological Survey to conduct a survey of the millipedes of the Buckeye State. Most recently, Derek published an article describing several new species of the millipede genus Mimuloria. As a PhD student here at Virginia Tech, Derek plans to study mimicry in the cyanide-producing genus Apheloria and develop a taxonomic monograph of the Appalachian millipede genus Nannaria. Welcome Derek and Rhea! Jackson Means, PhD student in the lab, made the front page of Virginia Tech’s website! Jackson participated in a communicating science course through VT’s School of Performing Arts. Pictured below, Jackson is demonstrating the evolution of insect wings through outgrowths of the pleuron into epicoxal lobes (his arms depict the epicoxae). Our recent PNAS article about the gradual evolution of bioluminescence in millipedes is featured on the front page of the National Science Foundation’s website! Each week Tom McFadden, science rapper and 8th grade teacher extraordinaire, chooses an article from the New York Times science section to rap about. 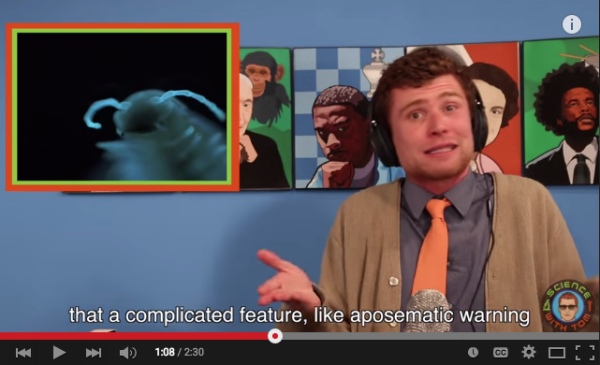 This week, he chose to highlight bioluminescent millipedes! Be sure to check out his other YouTube videos and this song by his students about Rosalind Franklin and the discovery of DNA! James Gorman and David Frank at the New York Times scientific series ScienceTake wrote an excellent summary of our research, including a fantastic video! Our laboratory’s millipede research is highlighted on the home pages of the National Science Foundation and Virginia Tech! Undergraduate student Pat Shorter joins the lab for the summer. Her position is supported by an REU stipend as part of our NSF grant on millipede phylogenomics (DEB#1256139). Welcome Pat! 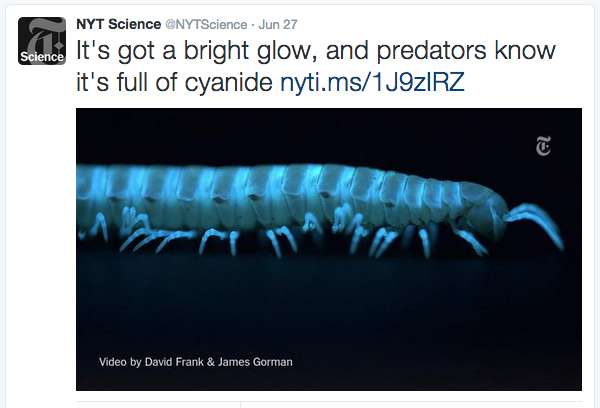 Our recent bioluminescent millipede paper highlighted by National Geographic News, Discovery News, and Полит.ру! Our paper about the evolution of bioluminescent millipedes was published in PNAS!